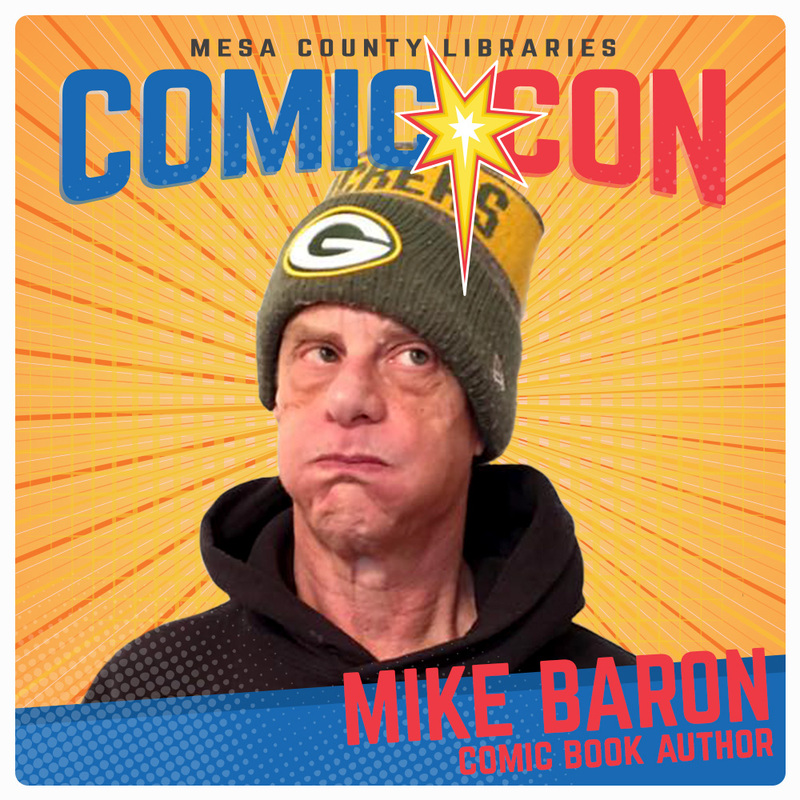 Mesa County Libraries are proud to announce that comic book writer Mike Baron, co-creator of the long-running superhero comic “Nexus,” will be a special guest at Mesa County Libraries Comic Con on Saturday, Oct. 6, 2018. At Comic Con, Baron is scheduled to participate in a question-and-answer session with a moderator, and he also will respond to audience questions. He will be available for autographs and book-signings after his presentation. Baron is the creator of “Nexus” (with artist Steve Rude) and “Badger,” two of the longest-running independent superhero comics. “Nexus” is about a cosmic avenger 500 years in the future, and “Badger” is about a person with multiple personalities, one of whom is a costumed crime fighter. Baron has won two Eisner awards, which are sometimes referred to as the Academy Awards of the comic book industry, and an Inkpot award, another highly regarded award in the comic and science fiction industry. He has written for “The Punisher,” “Flash,” “Deadman,” and “Star Wars,” among others. Baron has published seven novels: “Banshees,” “Domain,” “Helmet Head,” “Whack Job,” “Biker,” “Sons of Privilege,” and “Skorpio.” “Banshees” is about a satanic rock band that returns from the dead. “Helmet Head” is about Nazi biker zombies. “Whack Job” is about spontaneous human combustion. “Biker” is a hard-boiled crime story about a reformed motorcycle hoodlum turned private investigator. “Skorpio” is about a ghost who only appears under a blazing sun. A longtime writer, Baron has written for the Boston Phoenix, the Boston Globe, Oui, Fusion, Creem, Isthmus, Front Page Mag, and Ellery Queen’s Mystery Magazine. Baron’s presentation is one of many exciting events being planned for Mesa County Libraries Comic Con, set for 9 a.m.-5 p.m. Saturday, Oct. 6, 2018, at Two Rivers Convention Center, 159 Main St. in downtown Grand Junction. Last year’s Comic Con attracted more than 5,000 people, and this year’s attendance may be larger yet. The 2018 Comic Con will feature a larger exhibition space, exciting cosplay and costume contests, intriguing panel discussions, fascinating speakers, and more.